Although I purchased my pressure cooker for making stocks, I thought it would be nice to try making a pressure-cooked stew as well. Pressure cookers are known as “fast cookers” (or actually “fast cooking pan”, “snelkookpan”) in Dutch, and in this case it is true because stewing beef in a pressure cooker only takes 20 minutes instead of 3 hours. Stating it like that is cheating a bit, because after those 20 minutes you need to wait for about half an hour for the pressure to go down. But still, it still means that you only have to start cooking 75 minutes or so before you’re having boeuf bourguignon and that is kind of nice. I didn’t do a side-by-side test, but I couldn’t detect anything special about the pressure-cooked boeuf bourguignon compared to the traditional preparation. The meat was tender and flaky and just a tiny bit dry just like usual, and just like usual the slight dryness is overcome by the nice sauce. I do not completely understand why the meat comes out this nicely, because in a pressure cooker the meat is cooked at about 120C/250F so I would expect the meat to be dried out a lot more. From sous-vide cooking I know that temperatures above 70C/160F can already lead to dryness (because at such temperatures, muscle fibers will contract and squeeze out the juices). I’ll have to dry doing boeuf bourguignon sous-vide to see whether it can me made more juicy that way, but that would certainly take longer. 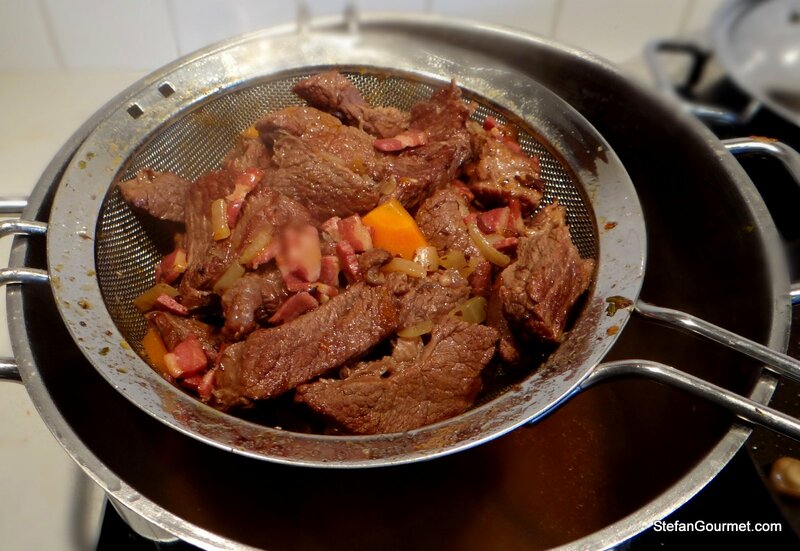 You can use the same recipe to make boeuf bourguignon in a regular casserole, you will just need to simmer it for 3 hours or so instead of pressure cooking for 20 minutes. Here’s what I did. 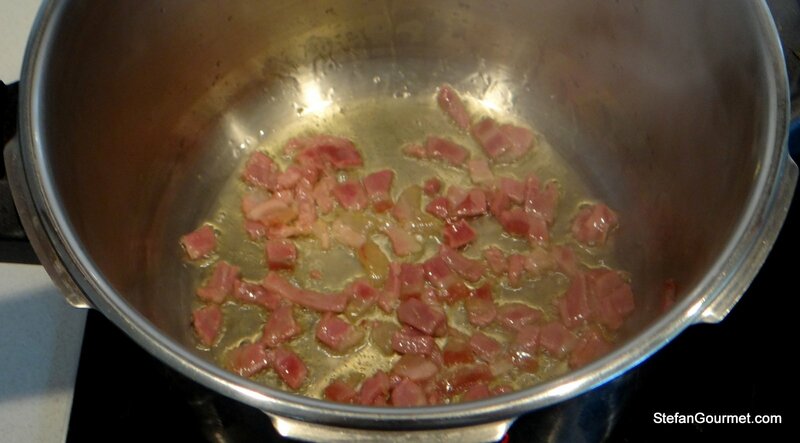 Cut the bacon into lardons and brown in the pressure cooker in olive oil. 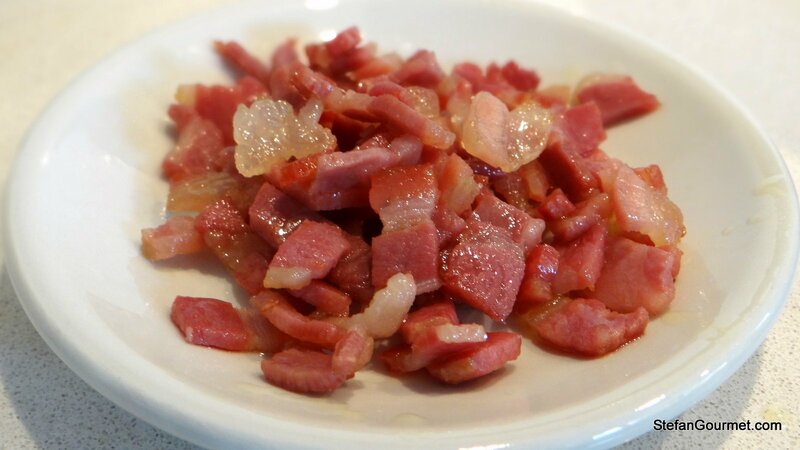 Remove the bacon to a side dish with a slotted spoon. 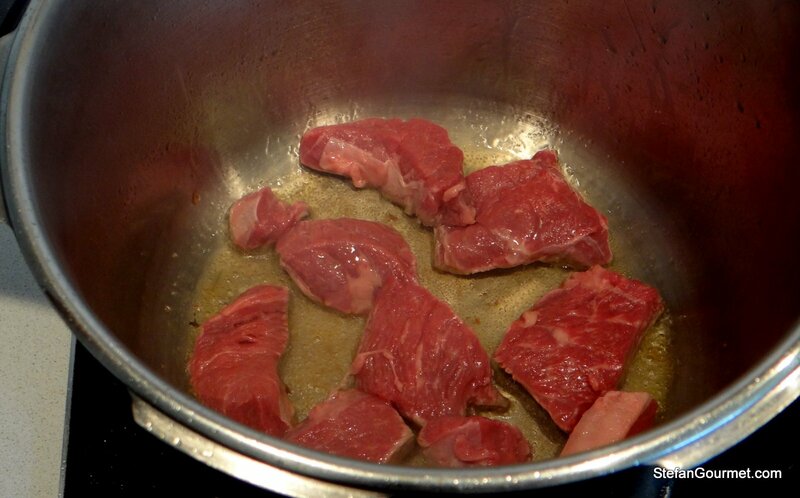 Cut the beef into chunks and brown in the oil and bacon fat over high heat on all sides. Remove the beef. 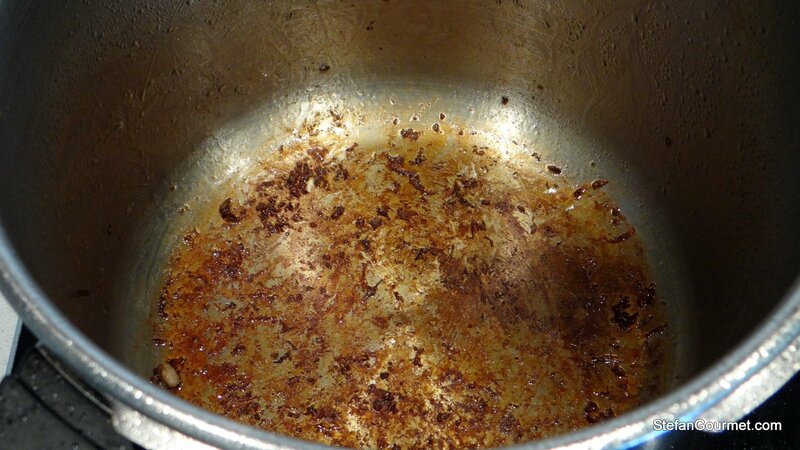 There should now be a lot of brown flavorful bits attached to the bottom of the pot. 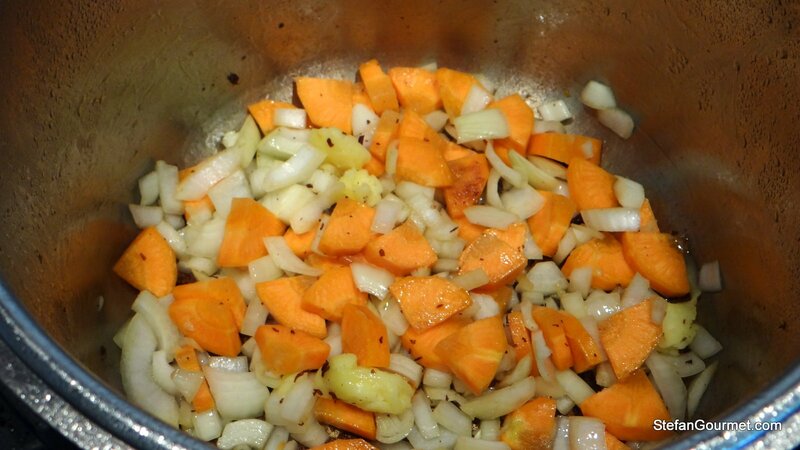 Add the onion and carrot and sauté for about 5 minutes over medium heat. Add a bit more olive oil if needed. Crush the garlic and add. Sauté for a minute longer. 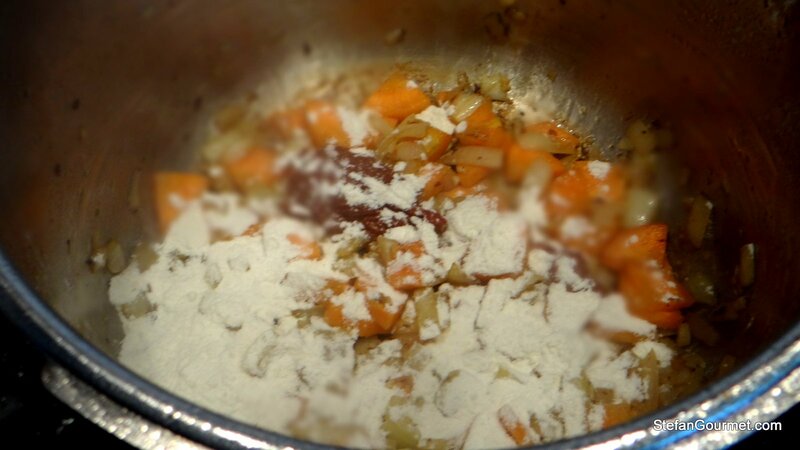 Add the flour and tomato paste, and sauté for another minute. 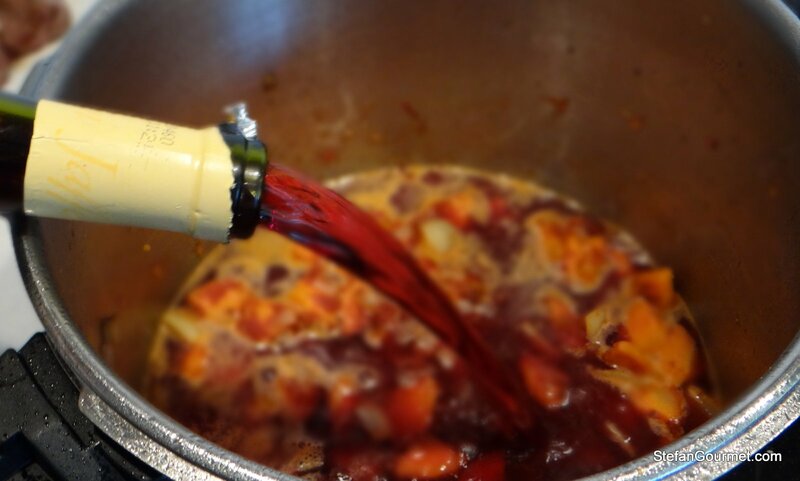 Bring to a boil over high heat, then lower to medium and reduce wine by half. 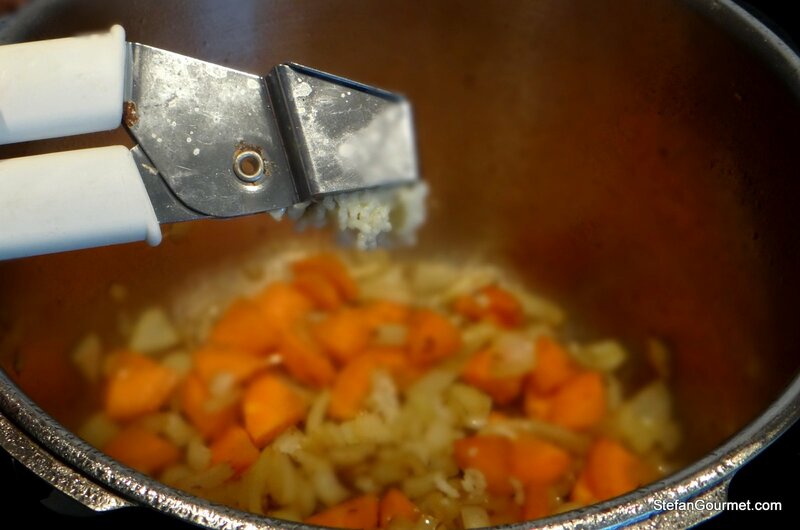 Scrape the flavorful bits off the bottom using a wooden spatula. Add the beef (including any juices that leaked out) and the lardons back to the pressure cooker. Add the beef stock. The meat should be barely covered. Tie some parsley and thyme into a bay leaf. This is called a bouquet garni. Tying it together facilitates removing it again later. 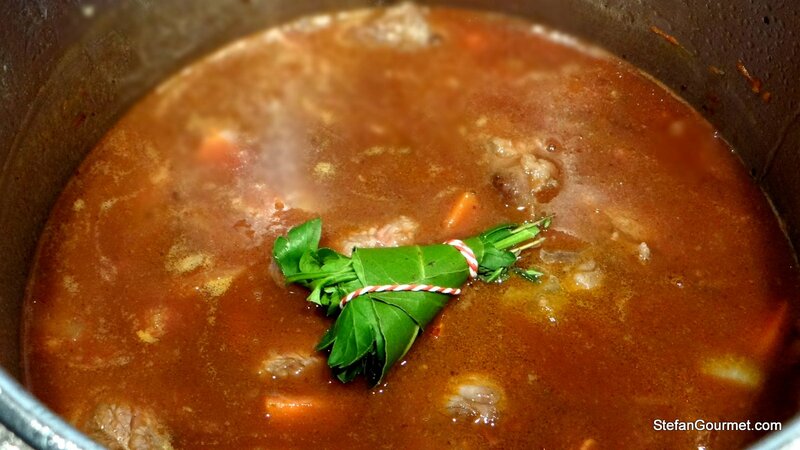 Add the bouquet garni to the pressure cooker. 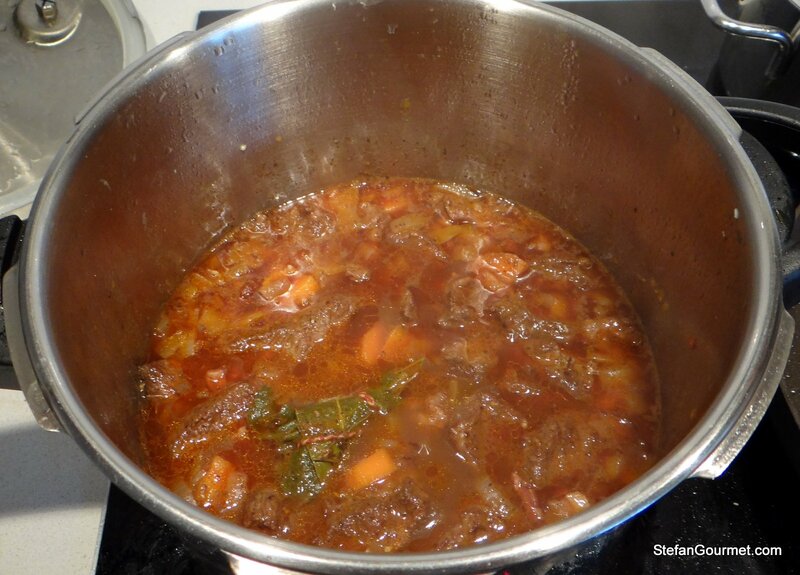 Close the pressure cooker and pressurize over high heat to the high pressure setting (13-15 psi). Lower the heat once pressure has been reached. Now cook for 20 minutes. Turn off the heat and wait until the pressure has dropped again. The beef should now be tender. Discard the bouquet garni. Remove the meat from the sauce. 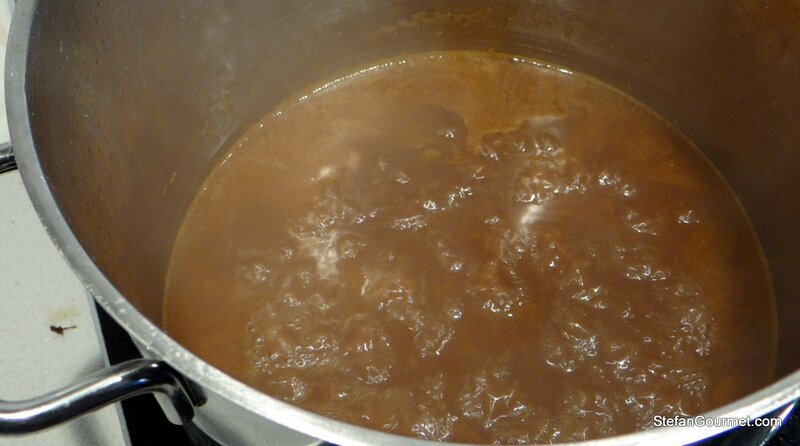 Cook the sauce over high heat for a few minutes to thicken it. Mix a tablespoon of flour and a tablespoon of softened butter to make beurre manié. 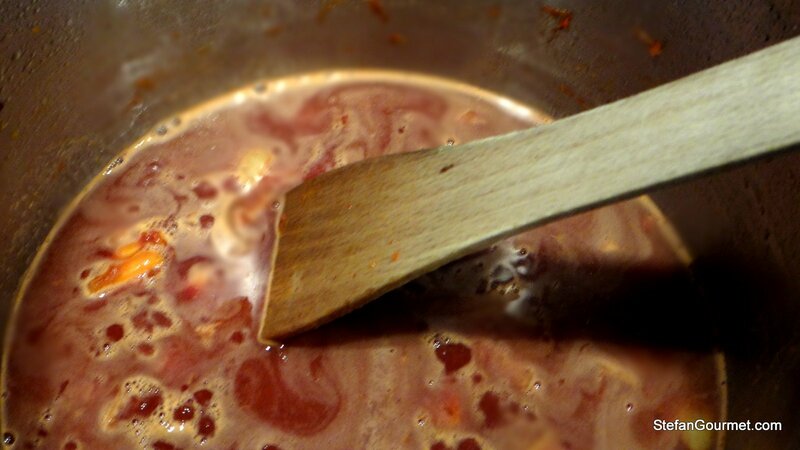 Stir the beurre manié into the sauce to thicken it some more. 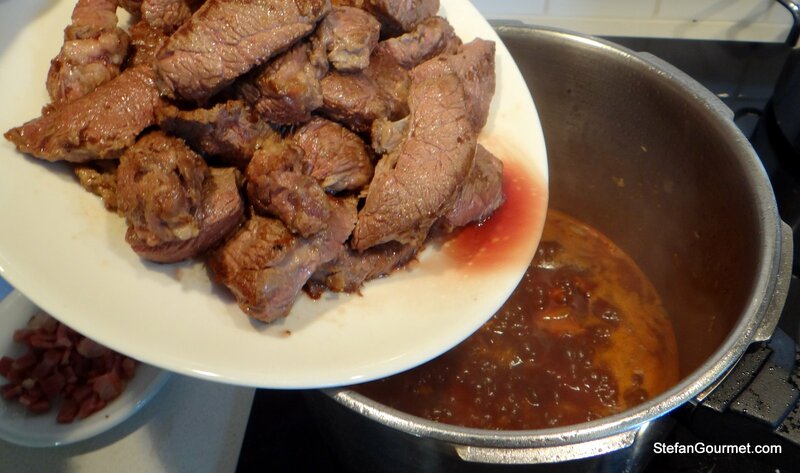 Lower the heat and return the beef to the pan to heat it through. Serve the beef with the sauce, sautéed mushrooms and braised onions, and some fresh parsley for garnish. Boeuf Bourguignon is a dish from Burgundy, so a red burgundy is appropriate. 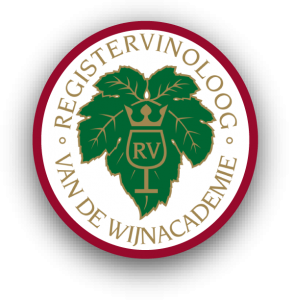 Pick a full bodied one that is from a vintage between 5 and 10 years ago. You are taking all the mystique out of the classics. Great energy saver. Looks lovely all the same. Oh this is nothing compared to some of the Modernist Cuisine recipes. That’s not like anything that resembles “real cooking”. And actually, for me there is some magic about tightly closing a pressure cooker, not being able to see what goes on inside, and waiting to see what comes out. Stefan, love this post, more descriptive than mine for sure heheh, and I’m sure you used a better wine too! 🙂 btw, if you want the pressure cooker to depressurize quicker, just run cold water over it in the sink, it would take 10 seconds and you’re good to go. 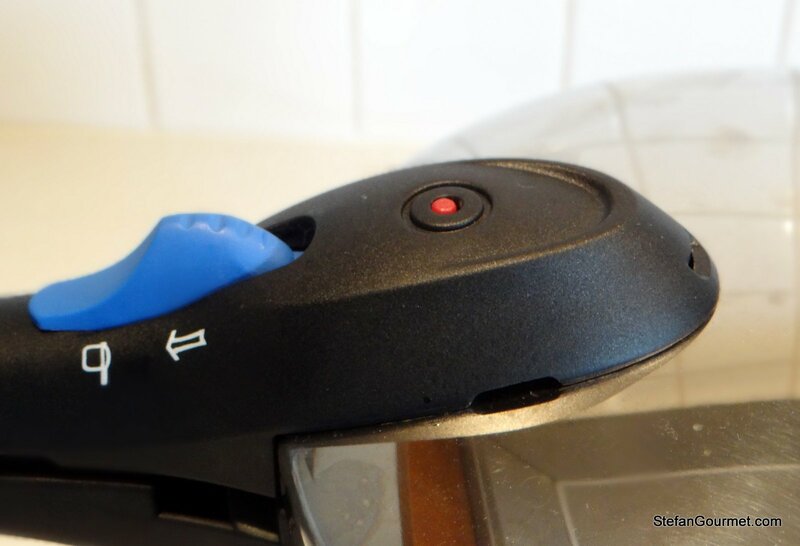 Another thing you probably already know, you shouldn’t hear steam releasing off the pressure cooker while its cooking. Once it reaches the correct pressure and the little knob goes up, I lower the temperature and the inside of the vessel should remain at 120c. 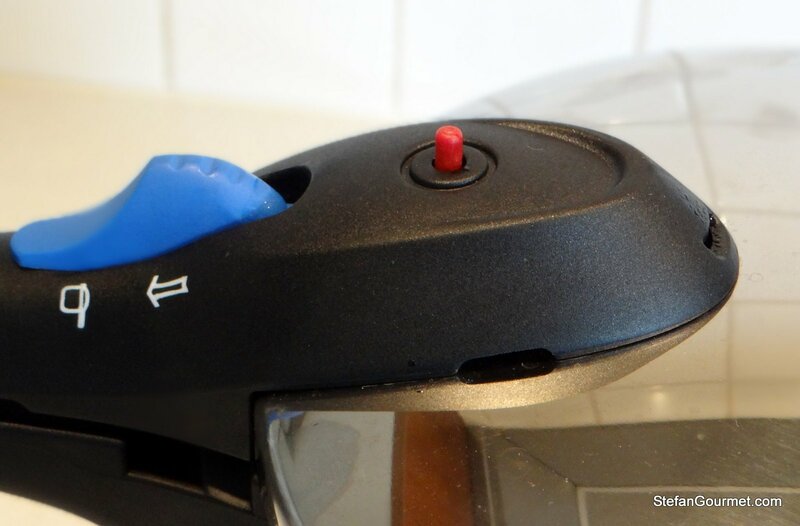 If the knob should drop, then you’ve gone to far lowering the temperature. takes a little getting used to i guess. Thx for this, I’m really just getting to know the pressure cooker. Nicely done, Stefan. Great looking dish and I’m sure it was fabulous. It doesn’t really matter how you did it, Stefan. 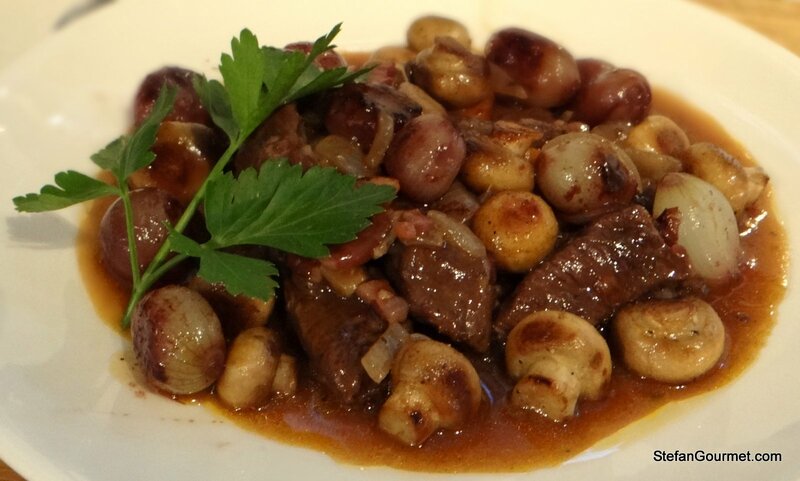 That final photo is what I hope my bœuf bourguignon will look like when I serve it. That’s perfection on a plate and I bet it tastes the part, too. Thanks, John. I’ve just made it again last night ‘the old-fashioned way’ (in a Dutch oven on the stove top) and it turned out great, otherwise using the same recipe. This looks absolutely delicious Stefan! I grew up with pressure cooker in the house. We used it nearly every day. We never had pasta or rice. It was always potatoes..made in the pressure cooker. (and fish soup) They did taste great! I know that pressure cooking will deepen the flavor of tomatoes, but I am not sure if Maillard is the correct way to identify the process that will take place. Maillard will work best in a dry and alkaline environment at high temperatures. When pressure cooking tomatoes, you only have a reasonably high temperature (about 120C, a lot lower than the 150C/180C that is more optimal for Maillard) and it is wet and acidic. P.S. I agree with you that slow-cooked meat is superior to pressure cooked. The only good side is that it is very quick!